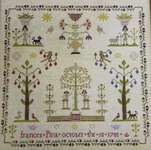 A large traditional wall hanging featuring Adam and Eve with the Tree of Life. 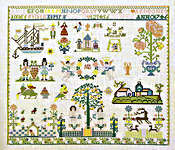 The large scale black and white charts are printed 10 stitches to 2 centimetres on eight A3 sheets. 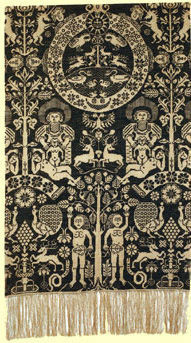 The pattern is worked completely in whole cross stitch using blue wools, 2 strands over 2 fabric threads. The stitch count is 305 by 530 stitches.